Social and environmental systems are linked and, as this relationship becomes ever more apparent, governments, communities and organizations are increasingly faced with, and focused on, problems that are complex, wicked and transgress traditional disciplinary boundaries. This article in the journal Nature Sustainability suggests that evidence-based approaches to solve these complex multi-disciplinary challenges must draw on knowledge from the environment, development, and health domains. To address barriers to the consideration of evidence across domains, this paper develops an approach to evidence assessment that is broader and less hierarchical than the standards often applied within disciplines. Green banks use funds to reduce the risk for private investment to support energy efficiency and clean energy. As local governments and corporations across the Southeast make progress on ambitious clean energy goals—including some with 100 percent renewable energy targets by as early as 2025—demand is growing for financing to make those goals attainable. 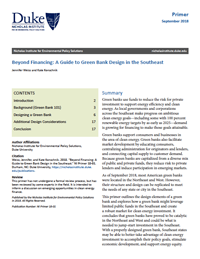 This primer outlines the design elements of a green bank and explores how a green bank might leverage public funds in the Southeast to create a robust market for clean energy investment. 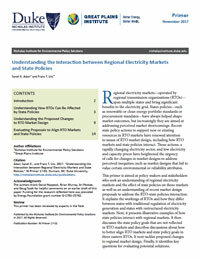 Regional electricity markets—operated by regional transmission organizations (RTOs)—span multiple states and bring significant benefits to the electricity grid. States policies—such as renewable or clean energy portfolio standards or procurement mandates—have always helped shape market outcomes, but increasingly they are aimed at addressing perceived market shortcomings. Recent state policy actions to support new or existing resources in RTO markets have renewed attention to issues of RTO market design, including how RTO markets and state policies interact. Those actions, a rapidly changing electricity sector, and low electricity and capacity prices have heightened the urgency of calls for changes in market designs to address perceived inequities, such as market designs that fail to value certain environmental or reliability attributes. This primer is aimed at policy makers and stakeholders who seek an understanding of regional electricity markets and the effect of state policies on those markets as well as an understanding of recent market design proposals that are designed to address the RTO-state policies interaction. In a new report, the Bipartisan Policy Center and Nicholas Institute for Environmental Policy Solutions explore the value, use, and limitations of economic modeling of the electricity sector. 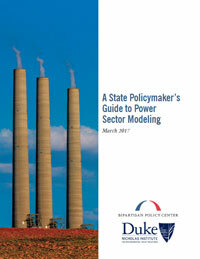 The report presents a suite of recent analyses by different organizations, showing how economic modeling can be used to simulate possible policy, market, and technology changes as the electricity sector transforms due to growth of domestic natural gas, increased use for electric generation, the rapid progress of renewable technologies, and environmental regulations. It is meant to be a guide for state policymakers who have both the benefit and challenge of unpacking modeling results and figuring out how best to learn from diverse findings. It provides them with both an understanding of how to best utilize economic models and interpret their results as well as explores key modeling structures often being deployed to model carbon regulations such as the Clean Power Plan and input assumptions that impact power sector modeling results. 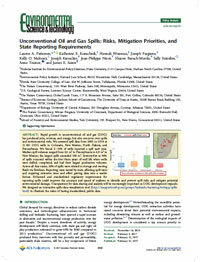 An analysis led by the Nicholas Institute for Environmental Policy Solutions, which appears in the journal Environmental Science & Technology, concludes that making state spill data more uniform and accessible could provide stakeholders with important information on where to target efforts for locating and preventing future spills. However, reporting requirements differ across states, requiring considerable effort to make the data usable for analysis. By examining state-level spill data, it finds that 2 to 16 percent of hydraulically fractured oil and gas wells across Colorado, New Mexico, North Dakota and Pennsylvania spill hydrocarbons, chemical-laden water, hydraulic fracturing fluids and other substances each year. The study characterizes spills associated with unconventional oil and gas development at 31,481 wells hydraulically fractured or "fracked" in the four states between 2005 and 2014, identifying 6,648 spills in the 10-year period. North Carolina’s ocean and coastal areas and their resources shape a unique and important segment of the state’s economy, particularly for its eastern region. From seafood and commercial fishing opportunities, to access to global markets through shipping and transport, and finally tourism and recreation, thousands of jobs and billions in revenue for the state depend on the ocean and coast. Yet to date, this segment of North Carolina’s economy has not been identified as a discrete contributor in the state. 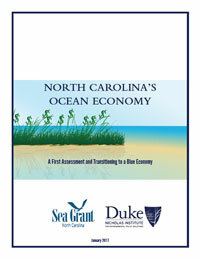 This working paper provides a first assessment of the existing information available to measure the size and extent of North Carolina’s ocean economy, and proposes next steps to transition to a blue economy. 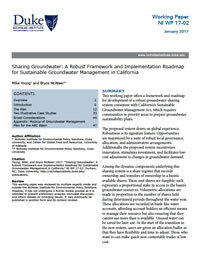 This working paper offers a framework and roadmap for development of a robust groundwater-sharing system consistent with California’s Sustainable Groundwater Management Act, which requires communities in priority areas to prepare groundwater sustainability plans. The proposed system draws on global experience. Robustness is its signature feature. Opportunities are maximized by a suite of robust local governance, allocation, and administrative arrangements. Additionally, the proposed system incentivizes innovation, stimulates investment, and facilitates low-cost adjustment to changes in groundwater demand. The health of freshwater animal and plant life is dependent on streamflow, yet identification of the flow regimes required to maintain ecological integrity remains challenging to states in the U.S. seeking to establish ecological flows that achieve environmental objectives. 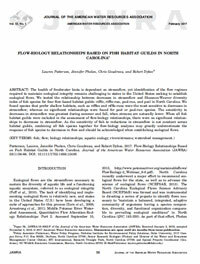 A new article in the Journal of the American Water Resources Association tests the relationship between decreases in streamflow and Shannon-Weaver diversity index of fish species for four flow-based habitat guilds: riffle, riffle-run, pool-run, and pool in North Carolina. The study finds that species who prefer shallow habitats, such as riffles and riffle-runs were the most sensitive to decreases in streamflow, while using all fish data greatly underestimated the response of fish species to decreases in flow. Since ecological flows are designed to protect the integrity and diversity of aquatic ecosystems, ecological flows should be established to protect those species most sensitive to changes in flow. Streamflow is a main determinant of the ecological health of rivers and streams. Assignment of streams to classes is suggested as an initial step in the process of establishing ecological flow standards that ensure the appropriate environmental objectives are achieved. 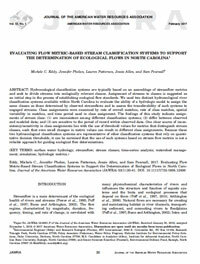 A new article in the Journal of the American Water Resources Association evaluated a hydrological model with two distinct hydroecological river classification systems of stream classes in North Carolina and found that stream classification was inconsistent between all three models and highly dependent on the period of record of the underlying data. Based on these results, it was surmised that classification systems based on streamflow metrics are not a reliable approach for guiding ecological flow determinations. Following recent droughts in North Carolina, the General Assembly convened an Ecological Flows Science Advisory Board to develop a strategy for establishing flow regimes that could protect the ecological integrity in the streams and rivers of North Carolina. 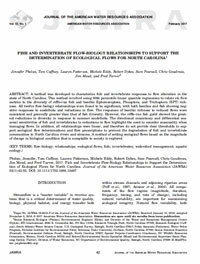 A new article in the Journal of the American Water Resources Association describes the method developed to characterize fish and invertebrate responses to flow alterations in the state of North Carolina to aid in setting ecologically sensitive flows that achieve appropriate environmental objectives.